onionriverchiro | Balance. Function. Wellness. Gift Certificate must be presented at time of redemption. Time cannot be split. Promotion value ends 2/14/2018. After 2/14/18 value may be applied to reg. price massage until 2/14/2023. With the last of the holiday sweets eaten and Valentines Day on the horizon, now is the perfect time to think about sugar. We all know that too much sugar is bad. It is addictive, causes weight gain, and lurks in almost every food we eat. Natural sugars, like the sugars in fruit, are usually not the problem; it’s the added sugar that adds up. With the current obesity crisis and soaring rates of Type II Diabetes, controlling simple sugar intake has become even more critical. It seems like the obvious solution is to eat less sugar. But that’s the hard way, and we Americans are always searching for an easier way to do things. So, rather than trying to curb our intake of sweets by reducing sugar consumption, the food industry has invested billions of dollars over the past decades to find sugar substitutes. Nearly every sugar substitute has its cheerleaders and detractors, and the research as to the benefits and side effects of each sweetener is divided at best and contradictory at worst. Take Splenda, for example. Splenda was marketed at its introduction in 1998 as a more “natural” artificial sweetener because it is “made like sugar.” Early research showed that sucralose passed through the stomach and intestines undigested, so it had no effect on the body, which meant no negative side effects. Sounds too good to be true? It is. In 2008, a Duke University study found that Sucralose contributes to obesity, destroys helpful bacteria in the gut, alters the pH of the body, and can reduce the absorption of some medications.1 More recently, a 2013 study by the Italian Ramazzini Institute showed that, when lab rats consumed Splenda on a daily basis, they developed Leukemia and other blood cancers. While the amount of Splenda consumed by the mice was the equivalent of drinking ten diet sodas per day, the study, published in the International Journal of Toxicology and Environmental Health Part B: Critical Reviews serves to remind us that simply substituting an artificial sweetener for sugar is not the answer2. If you’re not quite ready to embrace black coffee, however, there’s hope. A better option than Splenda is Stevia. Stevia comes from an extract of the Stevia plant, which makes it actually natural. It has been used as a sweetener in teas and traditional medicine for centuries in Paraguay, Brazil, and Bolivia.3 Compared to Splenda, which is 600 times sweeter than sugar, Stevia is only 300 times sweeter.4 Stevia has no calories and is non-nutritive, although there is no evidence that it is more effective than Splenda or other sugar substitutes when it comes to weight loss. While some people have reported nausea and a feeling of fullness when using stevia, it has not been credibly linked to significant side effects. In addition, reaserchers at the University of New Haven in Connecticut have discovered that Stevia can act as an anti-microbial that is more effective than antibiotics in treating drug-resistant forms of the pathogen that causes Lyme disease.5 With the CDC estimating that 300,000 people are diagnosed with Lyme disease each year, Stevia is an excellent alternative to toxic and increasingly ineffective conventional antibiotics.6 It is important to note, however, that the Stevia used in the study is extracted from the whole Stevia Rebaudiana plant and, while it is available in this form, it is not necessarily the same extract found in commercial products like such as soda. Even so, for now, Stevia seems like the better sweet choice, at least compared to Splenda. All artificial sweeteners are, well, artificial. As in—fake. As in—someone in a lab somewehere made it. All artificial sweeteners are not created equal. The more processed a sweetener is, the farther away from natural. Not to mention all bodies react differently to different substances, which means side effects will vary unpredictably from person to person. If you have to feed your sugar demons, avoid refined sugar and substitutes. Treat them to natural products like Stevia, honey or maple syrup instead. Above all, the best way to reduce the effects of sugar is to consume less sugar, no matter what the form. Pay attention to labels. Be wary of hidden sugars in food that really does not need sugar, or much sugar anyway, like bread, commercial sauces and dressings, and crackers—even products marketed as “healthy” or “organic” can contain added sweetener. American culture is a culture of consumption and convenience and our taste for sugar is no exception. We demand instant access to everything and avoid inconvenience like an overly chatty neighbor. It only makes sense that our food is high in sugar content. The temporary energy rush sugar provides fuels the Faster! Easier! More! mindset, which requires more and more sugar to sustain. Realistically, cutting sugar out completely is a Herculean task. But cutting back on sugar is fairly simple. Look for products without high fructose corn syrup. Use measured quantities of sugar (and less of it!) in your morning coffee rather than pouring sugar from a jar. And remember, a sugar substitute is just a substitute, not a solution. By now you may have heard the phrase “sitting is the new smoking.” Beyond being clever, the catchphrase, coined by Mayo Clinic-Arizona State University Obesity Solutions Initiative director Dr. James Levine, underscores a disturbing fact. According to Levine, we lose two hours of our lives for every hour we spend sitting. In fact, in an interview with the LA Times, Levine makes a further comparison: “Sitting is more dangerous than smoking, kills more people than HIV and is more treacherous than parachuting. We are sitting ourselves to death.”1 With the CDC’s National Health and Nutrition Examination Surveys showing that 50-70 percent of Americans sit for six or more hours each day, sitting has truly become an epidemic2. The sitting epidemic is fueled by contemporary culture and lifestyle, particularly in the U.S. Our bodies and brains developed in response to particular environmental pressures and an active lifestyle. These days, most of us are not exposed to life-threatening scenarios on a regular basis. We exert little energy in our daily efforts to survive. Even our schools and workplaces promote the sedentary lifestyle: children are expected to sit still for hours upon end, and our workplaces have us sitting at desks, often typing away at keyboards for most of the day. Even our recreational habits have become less active: video games, instant access to movies and television shows, and virtual social environments tempt us to sit more and stand less. The science behind the sitting epidemic revolves around a neat acronym: NEAT. NEAT stands for non-exercise activity thermogenesis. Along with exercise activity thermogenesis, NEAT is the third component of human energy expenditure—calories burned during daily activity (basal metabolic rate, which is the energy required for basic body functions, and the energy needed to process food are the other two.) Some people have a “NEAT switch” that gets them up and moving after over-eating, while other people do not, which can lead to obesity. Surprisingly, the simple act of standing burns more calories than sitting, as noted in the table below. So what can we do about this national health crisis? Unlike with anti-smoking campaigns, we can’t tax chairs and benches, people can’t be banned from sitting in public spaces, and we can’t enact a legal sitting age. We can, however, actively participate in our own health. As shown above, just standing makes a difference. Some workplaces and even schools are using sit-to-stand desks, which allow the user to set their workspace at a different height in order to stand. If your boss is not quite there yet, or if you’re retired, here are some simple things to do to reduce the effects of sitting. Walk. Directly related to standing, of course, is walking. You should get up and walk around every 20-30 minutes. Stretch at your desk. Shrug your shoulders up to your ears and hold that position for several seconds before releasing. Gently stretch your fingers, hands, wrists and arms by bending at the joints. Straighten your legs and point and flex your toes. These simple stretches are great for multitasking: the person on the other end of the phone will never know! Use good posture. Your mother was never more correct. Good posture goes a long way to preserving the overall health of your spine and reducing stress on the nervous tissue of the spinal cord (which provides nerve input to all your muscles and internal organs.) Maintaining and supporting the natural curves of the spine is paramount to spinal health. While sitting at your desk/computer, use a lumbar and/or a thoracolumbar support cushion height along with proper workstation ergonomics (correct workstation, chair, and monitor height, proper keyboard placement, etc.). Exercise, exercise, exercise. With summer coming, it’s easier to jog, swim, or hike, and there’s always the treadmill or elliptical machines at the gym. While, by definition, exercising doesn’t affect your NEAT, it does help your overall metabolism and health. Moving around during the workday not only benefits individuals, but companies and schools as well. Research shows that productivity and focus improve if employees and students have the ability to stand or move during the day.8 According to Dr. Levine, “This is about hard-core productivity. You will make money if your workforce gets up and gets moving. Your kids will get better grades if they get up and get moving.”9 Like ergonomic keyboards, standing desks are becoming a workplace necessity. With summer coming, we’re likely to be more active outside of work. Warm weather tends to get us out-of-doors on the weekends and inspires us to exercise more overall. But after spending the weekend on the trail, don’t forget your body during the weekday grind. Take a stand for your health by taking a stand at work. 1MacVean, Mary. “‘Get Up!’ or Lose Hours of Your Life Every Day, Scientist Says.” Los Angeles Times, July 31, 2014. http://www.latimes.com/science/sciencenow/la-sci-sn-get-up-20140731-story.html. 2“Questionnaires, Datasets, and Related Documentation.” Accessed May 11, 2017. https://wwwn.cdc.gov/nchs/nhanes/Default.aspx. 3“Sitting Disease: The New Health Epidemic.” The Chopra Center, August 14, 2014. http://www.chopra.com/articles/sitting-disease-the-new-health-epidemic. 4“Sit More, And You’re More Likely To Be Disabled After Age 60.” NPR.org. Accessed May 4, 2017. http://www.npr.org/sections/health-shots/2014/02/19/279460759/sit-more-and-youre-more-likely-to-be-disabled-after-age-60. 6Just Stand “Burn Calories at Work.” http://www.juststand.org/Portals/3/literature/Burn_Calories_at_Work_Flyer.pdf Accessed May 11, 2017. 7 “Sitting Disease: The New Health Epidemic.” The Chopra Center, August 14, 2014. http://www.chopra.com/articles/sitting-disease-the-new-health-epidemic. 8 Clemes, Stacy A., Sally E. Barber, Daniel D. Bingham, Nicola D. Ridgers, Elly Fletcher, Natalie Pearson, Jo Salmon, and David W. Dunstan. “Reducing Children’s Classroom Sitting Time Using Sit-to-Stand Desks: Findings from Pilot Studies in UK and Australian Primary Schools.” Journal of Public Health 38, no. 3 (September 17, 2016): 526–33. doi:10.1093/pubmed/fdv084. 9MacVean, Mary. “‘Get Up!’ or Lose Hours of Your Life Every Day, Scientist Says.” Los Angeles Times, July 31, 2014. http://www.latimes.com/science/sciencenow/la-sci-sn-get-up-20140731-story.html. Why do I have fallen arches? Our feet are charged with supporting our entire bodies, maintaining our balance, and acting as shock absorbers. They are under constant strain: even a gentle stroll causes stress to the feet, particularly the arches. And because our arches can wear down overtime, this stress can lead to pain in other regions of the body as well as in the feet. What we call the arch of the foot is actually three arches made up of the bones of the feet. Ligaments and tendons made of semi-flexible fibers connect these bones. The fibers bend and stretch as we walk, but, unlike other more flexible fibers in the body, they are less elastic and more plastic (rigid). Consider the difference between a rubber band and a piece of taffy. If you stretch out a rubber band, it will snap back to its original shape. But if you pull on a piece of hard taffy, the taffy will just stretch. It will regain some of its original shape, but as you continue pulling it, the taffy will begin to lengthen until it wears thin and loses its shape: once you stretch a piece of taffy, it will never be the same again. The arches of your feet are like taffy. Normal use slowly breaks down the fibers in the arches until they can no longer support the rest of the foot. The arches collapse, causing overpronation of the foot which pulls on the fascia of the bottoms of the feet and can lead to plantar fasciitis as well as pain in the ankles, Achilles tendon, and the inside of the knee. Fallen arches can also cause or contribute to lower back pain and lateral hip pain. Fallen arches occur more often over the age of forty and in women. While they can occur through normal wear and tear, a fall or regular participation in high-impact sports can increase the likelihood of damage to the arches. In addition, obesity, diabetes, high blood pressure, and steroid injections may contribute to the degradation of the arch. Your genes can play a role in the development of fallen arches or flat feet as well. For example, if your mother or father had dropped arches or flat feet, you may as well. The good news is that you can do something about it. Orthotics can provide support when your arch collapses, preventing plantar fasciitis, heel spurs, Achilles tendonitis, and ankle pain from developing. If you are already suffering from arch-related issues, orthotics can lessen the pain and correct the strain on your feet and bring that spring back into your step. Our office recommends non-custom Superfeet (priced at $36-$46) and custom orthotics made from your own imprint by Footlevelers. For most people one of the most stress inducing things that happens in any doctor’s office is the taking of blood pressure. You can tell yourself to relax, breathe easy and envision yourself on a beach, but the truth of the matter is you are at a doctor’s appointment for one reason or another having your health evaluated. What is the most concerning is that a lot of people aren’t exactly sure what the numbers mean or where they come from. In this article we will be going over how to understand blood pressure readings, why it matters, understanding your risks, and new research on how to lower that high blood pressure and improve quality of life. Blood Pressure– is a ratio of systolic over diastolic and is measured in millimeters of mercury, mmHg. Systolic– is the top number of the ratio and is the higher of the two. It measures the pressure of the body’s arteries when the heart muscle contracts. Diastolic– is the bottom number of the ratio and is the lower of the two. It measures the pressure of the body’s arteries between heartbeats, aka contractions, so this is when the heart muscle is relaxed. The systolic, or top number is the more important of the two and usually slowly increases with age after 50, due to stiffness of arteries, plaque buildup etc. Blood pressure should be taken at least once every two years, even if it is around normal, and more frequently if it is higher. The numbers change in a person minute to minute due to the time of day, exercise, stress, lack of sleep, posture, and the food one has eaten! If your blood pressure is higher than desired, your doctor might monitor it on a consistent basis and/or have you keep track of it frequently at home. Even if your blood pressure is normal, it is always a good idea to develop healthy lifestyle habits to help prevent high blood pressure (HBP). Recent research from the National Institutes of Health has shown that being more aggressive in the treatment of high blood pressure, can significantly lower a person’s rate of cardiovascular disease. Until recently, it was recommended by the American Heart Association that the systolic pressure should be less than 140 mmHg for most adults to be out of the high blood pressure or hypertension category. This new research found that decreasing the systolic number to 120 mmHg and below reduces the risk of death of cardiovascular disease by 43%. In 2013, 360,000 deaths were associated with or directly related to high blood pressure. About 80 million, or one in three American adults have HBP which puts them at a much higher risk of heart attack, stroke, kidney failure and other serious health problems.New research from Tulane University School of Public Health and Tropical Medicine, found that patients age 75 and older benefited even more from this lowering of the systolic blood pressure than the younger age group. However, one unfortunate side effect in some patients in the aggressively treated group with medication, is acute kidney failure. Even with the immediate push for a lowering of the systolic BP, experts all agree that the best way to go about it is a thorough lifestyle change and not rely on drugs alone. The US National Institutes of Health has created what is known as the DASH diet plan (dashdiet.org) in order to lower blood pressure without medication, and also subsequently aid in weight loss. Through copious amounts of research, DASH is a strict eating plan that is rich in vegetables and fruit, low-fat and nonfat dairy products, along with beans, nuts, and seeds. The snacks and meals are balanced with both fiber filled foods (fruits and vegetables) along with food that is protein-rich and/or contain heart healthy fats (nuts, seeds, avocado, fatty fish) that aid in offsetting hunger. A decrease in high blood pressure was achieved by decreasing the amount of “empty carbs” (pasta, bread, rice, sweets, ice cream, candy etc.) consumed and replacing them with heart healthy fats and/or protein. By doing so, the diet provides more key nutrients which includes: potassium, calcium, and magnesium, which all contribute naturally to lowering blood pressure. http://www.heart.org/HEARTORG/Conditions/HighBloodPressure/AboutHighBloodPressure/Understanding-Blood-Pressure-Readings_UCM_301764_Article.jsp#.Vs3IevkrLIU “No-Smoking Confidence Assessment and Tips.” Understanding Blood Pressure Readings. American HEart Association. N.p., 18 Dec. 2015. Web. 24 Feb. 2016. “Why Blood Pressure Matters.” Why Blood Pressure Matters. American Heart Association. N.p., 13 Aug. 2014. Web. 24 Feb. 2016. “Understand Your Risk for High Blood Pressure.” Understand Your Risk for High Blood Pressure. American Heart Association, 18 Dec. 2015. Web. 02 Mar. 2016. “More Aggressive Treatment of High Blood Pressure Saves Lives in Study – News on Heart.org.” News on Heartorg. American Heart Association, 09 Nov. 2015. Web. 02 Mar. 2016. Goldschmidt, Debra, and Carina Storrs. “High Blood Pressure Control Improving; What Else to Do.” CNN. Cable News Network, 12 Nov. 2015. Web. 24 Feb. 2016. Heller, Marla. “What Is the DASH Diet?” What Is the DASH Diet? N.p., n.d. Web. 02 Mar. 2016. Do you ever wonder why it feels like you got hit by a bus the day or two after a deep tissue massage or workout? This is not necessarily a bad thing, but can confuse a lot of people into thinking that the massage or workout was bad for them. This symptom is actually called Delayed Onset Muscle Soreness or DOMS. DOMS is defined as activity that puts unaccustomed loads onto muscle causing soreness, 24-72 hours after exercise or intense massage. This is considered a normal repair process, in which the soreness is caused by microscopic damage to the muscle fibers during exercise or massage. A variety of cells and substances flock to the muscles to help repair those tears. Anatomically, it is usually caused by eccentric contractions which is when the muscle lengthens while load is applied. An example of this action is using the quad muscles while running downhill. There is a myth out there that says the soreness is caused by lactic acid, but this is actually not a component of the healing process. No treatment has been shown to be able to decrease the duration of DOMS except for rest and proper hydration. Even though the process might be uncomfortable or slightly painful, after the cycle has been completed, it is shown to make the muscles stronger and more capable to adapt to future strains. Since the more repetitions you do in a given exercise, the more damage and soreness there will be, it is suggested to gradually increase the duration of the exercise and/or intensity of the workout to minimize the likelihood of DOMS. Also, the general advice is to go through a proper warm-up, progress slowly into a new program, and stretch only after the body is warmed up. If the muscles are not used to massage, they will respond with soreness that should only last a day or two. It is always extremely important and helpful to communicate with the massage therapist what you expect from the session and your tolerance for deeper work so that they do not go over your limits or not be intense enough for your liking. After the massage, the typical take home instructions are to drink plenty of water immediately after and continue that for the next 48 hours. In addition, refrain from strenuous activity for the remainder of the day. Rest as if you just worked out. It is a good practice to either get a longer massage on a day where you are able to relax, or later in the day or at night when your activities have already happened. Shorter soft tissue or massage (<15 minutes) might be more enjoyable to some that do not want any discomfort in their session, and will most likely significantly decrease the likelihood of DOMS. Ask Well: Why Do Muscles Ache a Day or Two After Exercise? November 2, 2015. Reynolds, Gretchen. ACSM Information On…Delayed Onset Muscle Soreness (DOMS). American College of Sports Medicine. Why Am I Sore? 2003. Vanderbelt, Shirley. Benefits of using a foam roller is comparable to a deep tissue massage, myofascial release and myofascial trigger point therapy.Myofascial trigger points are taut bands or knots in the muscle tissue that can refer pain to other areas. Trigger points can also limit range-of-motion, inhibit muscle strength and cause muscle fatigue. Regular work can increase flexibility and performance while decreasing muscle tension and pain. Maximize the effectiveness of the foam roller by incorporating it into your daily stretching routine. Use the roller before and after activity, and always roll before you stretch. This will help to warm up cold muscles and prepare them for deeper stretching. Make sure you roll on soft tissue and not over joints, ligaments, or bony protrusions. Start by placing your body on a roller and slowly roll up and down the muscle. If you find a knot or tight band, hold that spot and try to feel the tissue release and soften underneath the pressure. Take deep breaths and try to keep your body relaxed as possible. Use of the foam roller can be painful. If an area is too painful to roll, place your body on the roller for 15 seconds before moving on to the next spot. As the tissue starts to loosen up you should be able to roll with less pain. Position the roller so that it’s inline with your spine, knees bent with feet flat on the floor. Make sure that it is supporting you from your tailbone all the way up to the back of your head so that you can relax everything during the exercise. Hold this position for 15-90 seconds as long as it is comfortable and does not cause pain. To target the the postural muscles on the right side, roll your body to the left, keeping your spine parallel to the roller, and stop on the muscles that run along the length of your spine. Hold for 15-90 seconds and allow yourself to relax. Repeat on the left side. Lie with your spine inline with the foam roller. Again, be sure to keep your head and hips supported on the roller. While keeping your knees bent and feet flat on the floor for balance, place your arms directly out to the side so you make a “T” with your body. The more advanced version of this stretch is to have your upper arms on the floor perpendicular to your body and elbows bent at a 90 degree angle up and pointing above the head. Hold for 15-90 seconds. Lie with the foam roller perpendicular to your body under the upper back. place your hands across your chest or behind your head with your elbows drawn in slightly toward midline- this allows for cervical spine support as well as letting your shoulder blades separate. If able, move body up and down a few inches at a time to target trigger points. Hold for 15-90 seconds as long as it is comfortable and does not cause pain. Lie on the left side with the foam roller perpendicular to the body and slightly below the armpit. Lean back slightly and extend the left arm out with your palm facing forward. Hold for 15-90 seconds. Repeat on right side. Lie with foam roller perpendicular to your body and across the shoulder blades, arms crossed on chest. 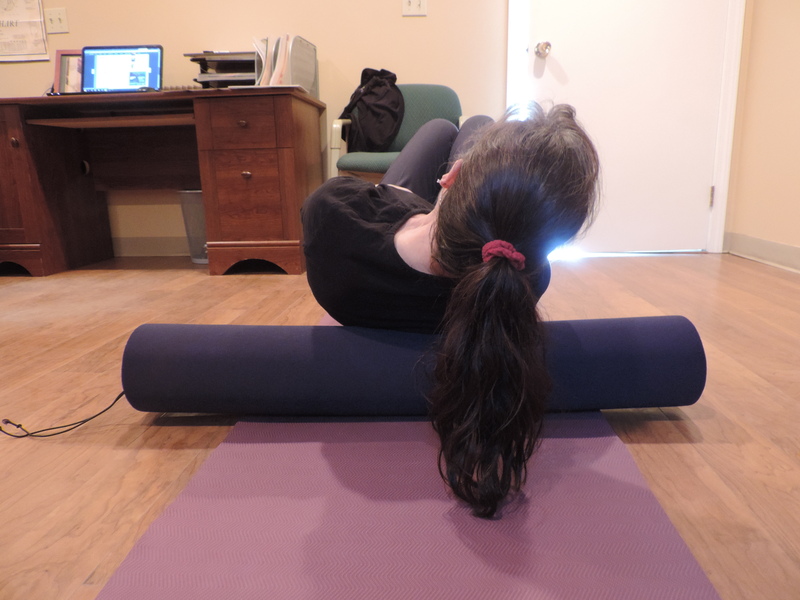 Turn slight to the right about 40-45 degrees or until the roller rest between the shoulder blade and spine. Once positioned, slowly roll your body up and down an inch or two in either direction along the rhomboid. Hold for 15-90 seconds. Repeat on opposite side of body. Reference: Foam Roller Techniques, OPTP, 2008, Michael Fredericson, MD, Terri Lyn S. Yamamoto, PhD, Mark Fadil, CMT, p. 15, 17, 23.